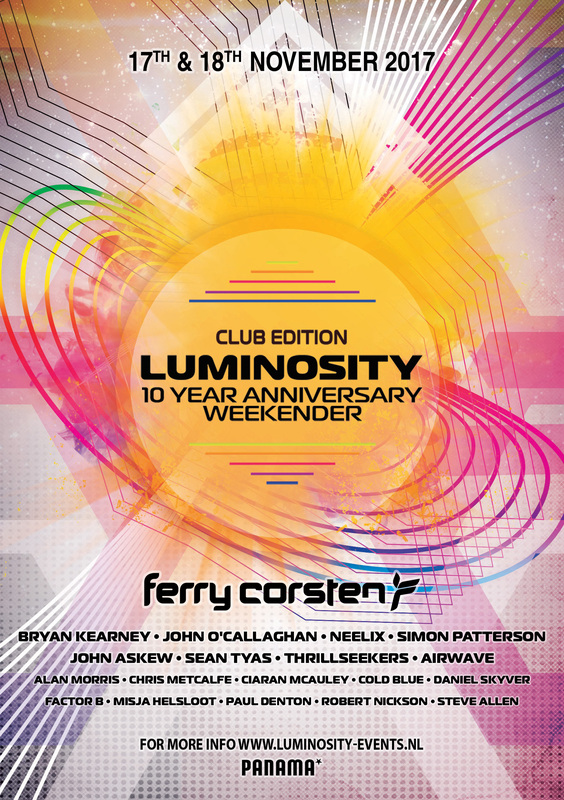 Luminosity celebrates 10 beautiful years together with YOU, the beautiful Trance Lovers and with our talented DJs and we are happy to continue this celebration with you and we are bringing to your attention this Luminosity 10 Years anniversary WEEKENDER in November in Amsterdam! Let us know you’re favourite artists in a comment! YOU ARE INVITED ^_^ The MADDNESS NEVER STOPS! ? Come join us with a bouquet of different trance sub-genres, so everyone will be happy. This entry was published on November 16, 2017 / evm. Posted in Events and tagged Airwave, Alan Morris, Bryan Kearney, Chris Metcalfe, Ciaran McAuley, Cold Blue, Daniel Skyver, Factor B, Ferry Corsten, John Askew, John O'Callaghan, Luminosity, Misja Helsloot, Neelix, Paul Denton, Robert Nickson, Sean Tyas, Simon Patterson, Steve Allen, The Thrillseekers. Bookmark the permalink.